Poverty, inflation are still the main headaches for Russians. A public opinion poll conducted by the Institute of Priority Regional Projects in February 2015 4 showed that three-fourths of Russians see the situation in the country as a crisis, Nikolai Mironov, general director of the Institute, said. The poll surveyed 1,600 Russian citizens aged older than 18. It was conducted in 120 populated areas in 43 regions of Russia. "The poll was timed to the March 1 rallies and not only to them. Its purpose was to determine people general attitude to the crisis, the opposition, the authorities' actions, etc. The first question we asked people was aimed at determining the degree of people's concern about the situation in the country. It said 'Should the situation in the country be called a crisis, or are these problems temporary?' Three-fourths of the people, 73.3 percent, said they see the situation as a crisis," Mironov told a press conference on Thursday. Mironov said 25.7 percent of the respondents see the situation "as temporary problems, not a crisis" and 1 percent were undecided. "Older people tend to think there is a crisis in the country: 76.2 percent of the people who said so are people older than fifty and 62.4 percent are people younger than 24," he said. Mironov said most people who talk about a crisis live in large cities and in cities with populations of over one million (77.6 percent and 77.8, respectively), in villages (67.5 percent) and in city-style settlements (71 percent). Responding to a question about the causes of the crisis, 49.3 percent spoke about "the external pressure from the West to stop Russia being a global superpower," 43.6 percent spoke about the falling oil prices, and 34.6 percent spoke about inefficient economic policy and unwillingness to invest in industrial development. "Over one-fourth of the Russians, 26.5 percent, link the crisis to Russia's support of the DNR and the LNR. This does not mean that people are negative about such support, but they link it to the crisis. A total of 18.5 percent of the respondents link the joining of Crimea to Russia to the crisis," Mironov said. Among the causes of the crisis named by the respondents is the inefficient policies of the government and the Central Bank on the currency market (20.4 percent). Another 11.9 percent said the crisis was caused by Russians' laziness and their unwillingness to work. "Only 6.8 percent of Russians link the crisis to the weakness of democratic institutions and manual administration of the country," the expert said. According to Mironov, 57.85 of the respondents give positive marks to the actions taken by the administration to deal with the crisis. "There is no denial. Despite the fact that people see the situation as a crisis, they don't believe that the administration is working badly. Almost 40 percent criticized the administration's actions. Responding to a question as to who could deal with the crisis better, 30 percent said they do not know and 36.4 percent said there are no such people," Mironov said. Mironov said the respondents were given three possible answers to the question about the cause of the crisis. Young people aged under 24 mentioned the falling oil prices (34.7 percent) and the weakness of democratic institutions (11 percent). Older people tend to blame the West (56.6 percent of the respondents aged between 45 and 49 and 53 percent of the respondents aged over 50 blamed the crisis on the West). Middle-aged people (aged 35 - 44) tend to speak about inefficient economic policies (38.8 percent) and inefficient policies of the government and the Central Bank (24.1 percent). "People living in Moscow and St. Petersburg tend to blame the crisis on the West (59.5 percent in St. Petersburg and 64.4 percent in Moscow) and the joining of Crimea to Russia (27.5 percent in St. Petersburg and 33.6 percent in Moscow)," Mironov said. Mironov reiterated that more educated people tend to believe the crisis was caused by falling oil prices, inefficient economic policies, and the policies of the government and the Central Bank on the currency market. The Public Opinion Foundation earlier published the results of its poll, according to which the percentage of Russians who believe there is an economic crisis in Russia has increased to 71 percent from 62 percent in January. Fourteen percent of the respondents said they see no indications of a crisis (against 20 percent in January and 15 percent were undecided. The poll, which surveys 1,500 residents living in 100 populated areas in 43 regions of Russia, was conducted on February 14-15. When asked how the crisis is manifested, the respondents mentioned growing prices and inflation (45 percent), declining living standards (11 percent), unemployment and layoffs (12 percent), the Public Opinion Foundation reported on February 24. 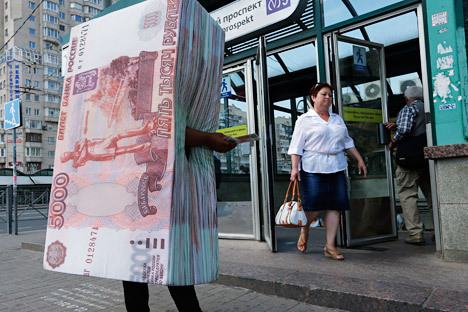 Compared to December 2014, the share of Russians upset by economic problems has grown by 9 percent. the plan states that the government plans to spend 52.2 billion rubles ($773 million) on additional measures on the labor market of Russia's federal subjects. This includes organizing public works and advanced professional training with the aim of lowering stresses on the labor market.